In long-term disability claims there are two common “definitions of disability” you must be prepared to address. For both definitions, it is essential the insurance company have detailed information about your current and past jobs. Important note: Each policy is different! Make sure you know what YOUR policy says. In most policies, the “own occupation” phase is first, and most commonly lasts for 24 months. 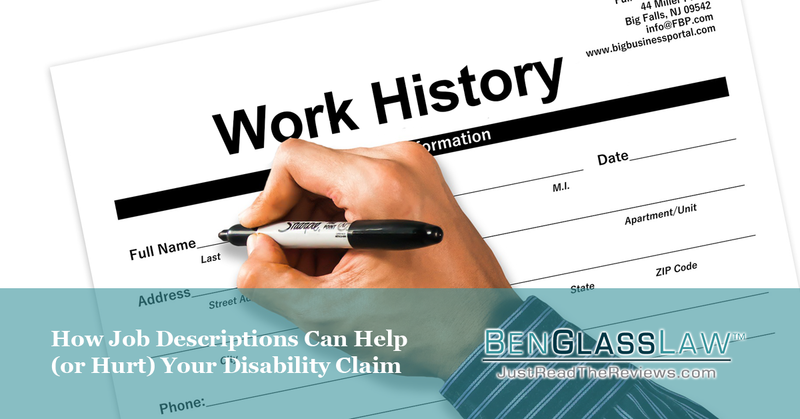 The “own occupation” period allows a claimant to receive disability insurance benefits if he or she is unable to perform their own occupation as it typically performed in the general economy. This means the insurance company will review the job duties of the claimant and select an occupation from the Dictionary of Occupational Titles (DOT) 1 which best represents that job. The disability insurance company will then assess the physical, psychiatric and cognitive abilities required by the job, and match those to the restrictions and limitations that a claimant has (which have been “approved” by the insurance company and which may or may not be the same as what your doctor says your restrictions and limitations are). If the restrictions and limitations don’t conflict with the job requirements, the insurance company will say that you can perform that DOT occupation (which may or may not closely match the actual job you have with your employer). Beware: there is significant potential for error in the identification of the proper DOT occupation. The insurer may use an outdated or generic job description which is not truly representative of the work you performed. The insurer may use a job title which also may not be truly representative of the duties performed. For example, an employee may have the job title of “Secretary,” considered a sedentary job. Someone with a knee or back issue restricting standing and walking would probably not be considered eligible for disability benefits if they have a sedentary job. However, if that “Secretary” actually performed filing, office supply distribution and copying, he or she may actually be an “Office Clerk.” This is light physical demand work and that same individual likely would be considered eligible for benefits. The “any occupation” phase begins at the end of the “own occupation” phase. This definition of disability typically allows a claimant to receive benefits if he or she cannot perform any work and earn a wage equal to or exceeding the required wage. The “required wage” is different for each policy, but most are between 50% to 80% of the wage you were earning when you became disabled. Instead of reviewing your restrictions and limitations against a specific DOT occupation that matches your job, the insurer will have a vocational consultant review your educational history as well as 15 years of past work history to determine what job skills you would have or could reasonably be expected to acquire. The consultant would then determine what occupations would be appropriate based on the skills you’re your medical restrictions and limitations. The vocational consultant would determine the likely wage you would earn in these identified occupations. If the insurance company finds a job that matches your skill set, is not ruled out by your restrictions and limitations, and meets your required wage, you can expect a denial letter. When the insurance company gives you a Work History form to fill out, it is very important to be as detailed and accurate as possible. If the documented work history is vague, the potential for error in the vocational assessment is high. We have a vocational consultant working for our clients who recently completed an assessment in which the insurer indicated the claimant was no longer eligible for benefits at “any occupation” based on her ability to work as an Office Manager. The claimant was a Corrections Officer most of her career but was now restricted to desk work. In her work history, she indicated that 10 years ago she had been an “Office Manager.” In the DOT, this is a skilled, supervisory occupation in which the person supervises office workers, establishes procedures, monitors production, and makes staffing and personnel decisions. The claim was terminated based on our client’s supposed ability to perform this one occupation. However, upon interviewing the claimant, our consultant found her job as an “Office Manager” was actually a clerk job in which she supervised no one and performed general office duties. She actually did not have the skills to qualify for the more demanding DOT “Office Manager” occupation, and thus would not be able to earn the required wage. What are the definitions of Disability and Disabled? What is your wage requirement? Know what’s in your claim file! Is the Job Description from your employer accurate? Have you filled out a Training, Education and Experience form? Does your doctor understand when and how the definition of Disability changes? You might have to educate him or her. Did your doctor take the time to fully explain your restrictions and limitations in your office visit notes? Does your doctor understand that their notes can be used to determine your eligibility for benefits? If your doctor says you can sit for 8 hours, the insurance company will assume that means “sit at a desk and work for 8 hours” unless your doctor explains why that’s not the case. 1 The DOT is a very, very old reference guide (many jobs were last updated in the 1970s!) that is still used by insurance companies to “standardize” job descriptions across different employers.